The Scottish style castle on Pollepel Island in the Hudson River was built in the early 1900’s. An on-island guided tour on the “Estuary Steward” is available. Also the site of the Constellation public art project by Beacon artist Melissa McGill. Information about tours, the island and the castle can also be found at Bannerman Island Gallery, 150 Main St.
More info: Beacon Bits” Blog by Nadine Revheim. The post office contains multiple TRAP funded murals by Charles Rosen that depict views and maps of the mid-Hudson region. The murals were painted in 1937. The post office was placed on the Registry of National Historic Landmarks in 1988. The Beacon Historical Society was established in 1976, with a mission to discover, procure, preserve and present Beacon’s heritage and history. The Society’s collections comprise over 5,000 items including books, prints, documents, photographs, postcards, paintings, maps, and artifacts — all relating to Beacon. Join us for informative presentations on local history held monthly (except January and February). Our meetings and special events including historic walking tours are announced on Facebook and our website. View our collections, research local history or volunteer at our headquarters on Thursdays from 10 am to 12 pm, and Saturdays from 1 pm to 3 pm. Extended hours on Second Saturdays or by appointment. The Beacon Sloop Club, Inc. is an all-volunteer environmental and sailing non-profit dedicated to cleaning up the Hudson River. The club maintains a wooden replica of a Hudson River Ferry Sloop called the Woody Guthrie. Launched in 1978, her purpose is to promote the beauty and wonder of the Hudson River by offering free sails to the public, provided by volunteer crews. The sloop club also upholds infrastructure of the Beacon Harbor, including moorings and docks. The Woody Guthrie is currently going through a major restoration, a project for which the club is still raising funds. We hold three festivals a year for fundraising and community outreach: the Strawberry Festival in June, Corn Festival in August and the Pumpkin Festival in October. Additionally the Sloop Club holds a monthly environmental lecture series from January through May of each year, at least one annual riverfront cleanup, a holiday sing, fundraisers for the Beacon Food Pantry, the sloop Woody Guthrie, work parties for Woody and Harbor maintenance, and other activities. Monthly meetings are held on the first Friday of every month and include a pot luck dinner and circle of song. The pot dinner starts at 6:30pm followed by the meeting at 7:30 and a circle of song at 9. The building is unique as it has a tree growing through the roof and a custom designed marine mosaic. All are welcome. Oldest home in Dutchess County. Open 2nd Saturday from 1 – 4pm, last tour at 3pm. There are many paths to the top of Mount Beacon and Fishkill Ridge, and all of them are strenuous. The main gateway is found at Mount Beacon Park, which is also where Beacon’s once famous Incline Railway was found. There has been renewed interest in bringing back the Railway recently, including an informational exhibit at Hudson Beach Glass in Feb/March 2014. Parking area and trailhead are located at the intersection of Route 9D and Howland Avenue in the City of Beacon. From intersection of Route 9 and Route 52, take Route 52 west through Town of Fishkill. Left onto Old Glenham Rd and then left onto Maple Street. After crossing bridge and at “Y” in the road, turn left onto Old Town Road. Right on Sunnyside Road. At end, bear left, then right. Continue up unpaved hill to parking area. 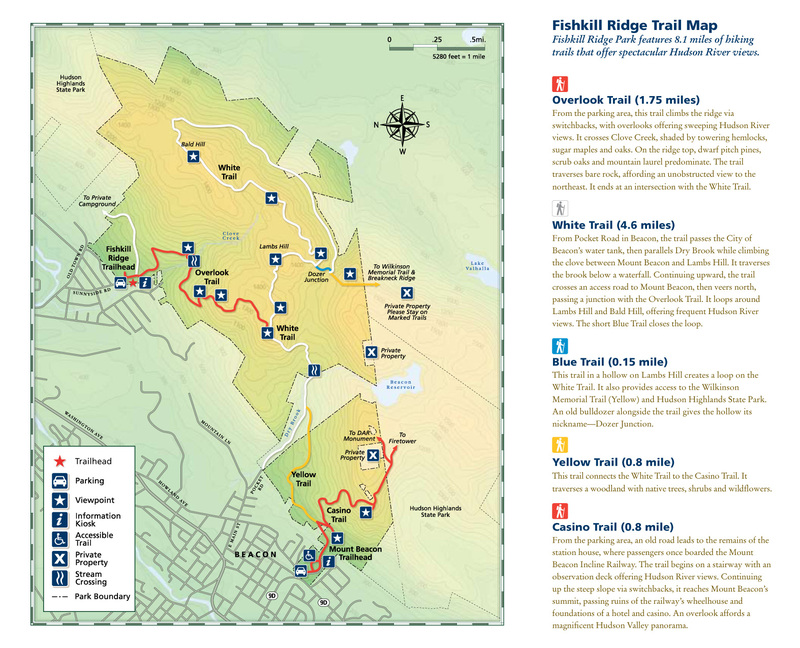 Click here for a printable trail map. Mount Gulian is a reconstructed 18th Century manor Dutch manor house on the Hudson River. A critical 19th-century transportation link between New England and points west, Long Dock once contained a rail ferry terminal, warehouses and other buildings. More recently, it was home to an oil terminal, salt-storage facility and junkyard. All traces of its commercial and industrial past have been removed to create an exciting riverfront destination boasting a kayak pavilion and beach for launching boats, rehabilitated wetlands and meadows that attract wildlife, and the restored, historic Red Barn, now Scenic Hudson’s River Center for arts and environmental-education activities. One of the most popular attractions in the park, at Long Dock’s tip, is Beacon Point, a shoreline installation by renowned artist George Trakas. The work projects out over the river (at high tide, water actually flows through it), making this a perfect place to fish, sunbathe and admire magnificent vistas of Newburgh Bay and the Hudson Highlands. Initiated in 1999 by Dia Art Foundation, this project was realized in collaboration with Scenic Hudson and Minetta Brook.